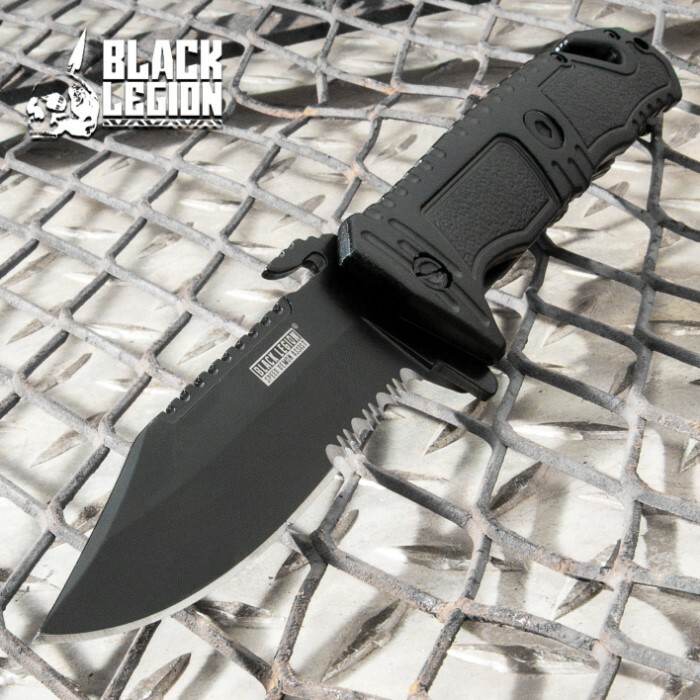 Black Legion Black Assisted Opening Military Fighter Pocket Knife | BUDK.com - Knives & Swords At The Lowest Prices! If you are looking for a tactical folder with a military edge, this knife from Black Legion is for you! The black coated stainless steel blade rockets open with ease with the fast action assisted opening mechanism. 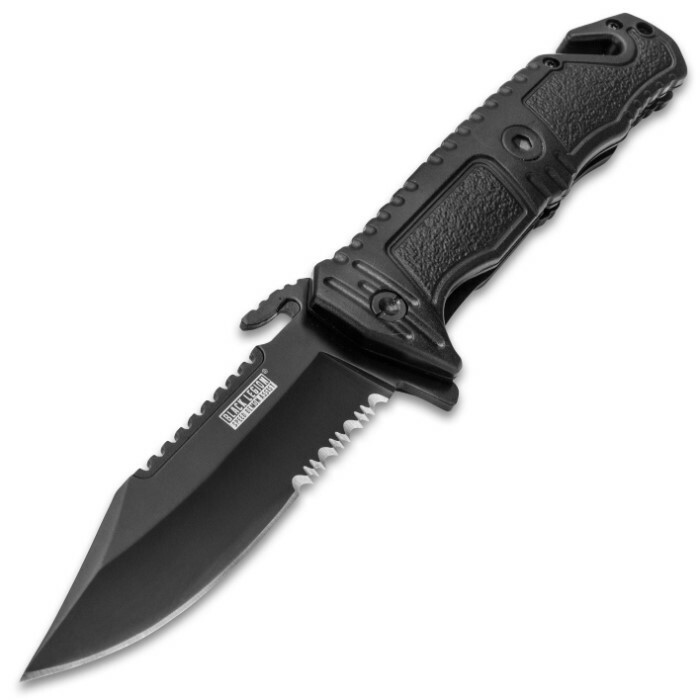 The blade is equipped with partial serrations and a sawback edge on the top of the blade. 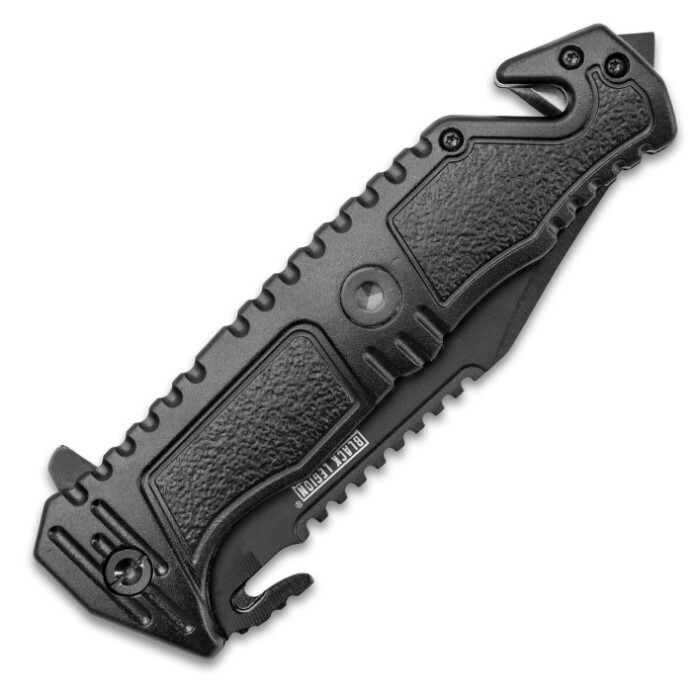 The black handle is constructed of stainless steel with ABS inlays and it even offers a belt cutter, a glass break spike and a pocket clip. This is the ultimate pocket knife! Awesome! Just what I wanted for a work knife. This knife is pretty sweet, very well made. Good weight, smooth, positive opening, solid locking, & very sharp. Got it on a BOGO so I consider it a very good deal. I received a pair of these. 1 for myself and 1 for my daughter. We absolutely love them..... They're nice and sharp, nice little knife. I needed something to give someone for a gift , knowing the she needed something that would be able to stay in her car. Great product 2 for the price of 1. Heavy and sharp. Really love everything about this knife. It looks heavy duty, but is still nice and light. The blade is sharp out of the box! This knife opens up much smoother than I expected for a knife this inexpensive. The blade was sharp out of the box, which is a plus for a lazy man like myself. It locks quite securely as well. I haven't had the knife long enough to see whether it was stand the test of time, but it seems like it can handle reasonably medium-moderate kinds of work. The grip is probably the weakest part of the unit for me; a little awkward, but you might like it. The grip isn't a deal breaker; I can hold it securely, it is just a bit bulky for me. I bought this knife during a BOGO with free shipping, so that sweetened the deal. The shipping was pretty quick for the holiday season and well packaged as always (I've been buying from BUDK for years). If you're looking for a smooth assist knife with a handy-dandy belt cutter, I wouldn't hesitate to recommend this one! I have bought one for every family member to keep in their vehicles. Excellent construction and very sharp! I bought this knife because it looked pretty cool in the pictures. I got the knife, and was disappointed. It didn't look as cool, it felt cheap, the assisted opening felt sloppy, there was nothing that I liked about this knife. This is one of only a few knives/swords that I've purchased that I have regretted doing so. Don't let me stop you from buying this knife; you may like it, others on here have. This is only my opinion. Got this as a beat up work knife, turns out that I carry\use this "tank" more than any other knife I own. Great feel, smooth opening, holds an edge, and takes a lot of abuse. I highly recommend it for anyone looking for a work knife.